Dale was a meticulous collector and categorized, and cared for all his items. Unless noted, the items are in very good or better condition. 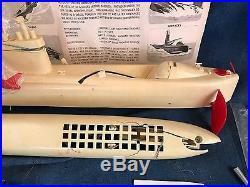 This model of the submarine USN Halibut which was a "test bed" submarine that saw service in the late 50's and early 60's is the zenith of the ITC Design and Engineering Team, and maybe of all operational plastic model kits. The model is not only rare but is considered the most complicated operating model ever produced. The large 24.75 inch long model sails from the battery power to a large electric motor driving twin geared propellers. It changes headings, dives, surfaces, and a Regulus II missile comes out of the hanger and launches... The engineering on this kit is fantastic and was a major break-through in its day (circa 1960). 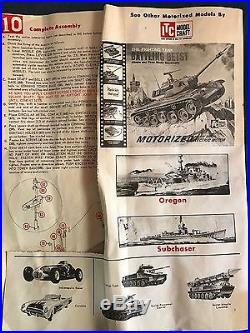 The high price and difficulties that youngsters had with assembly/operation made for a short production run. The model worked, and did work well, but was certainly not a toy for inexperienced model builders. This model kit has been mostly assembled, but has come apart over the years, and should be re- worked. 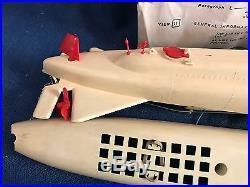 There is some breakage on the nose of the sub (see photos), but the parts have been saved in a bag for repair. From what I can see the kit is complete, but there may be small pieces or things that i have over looked that might be missing. 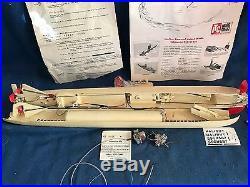 No original box, but the instructions are there , minus the , ail away catalog info on the back (see photos). This kit is "as is" and non-returnable due to it's "for parts" status. Please see photos as they are considered part of the description. We do wrap things securely with professional wrapping materials to get your item safely to you. We want you to be happy. I do my very best to represent the condition, type, etc of the materials I sell, however there is a possibility that I may overlook something, so it is your responsibility to read the description and accept the condition of the item being offered. Lack of mentioning a flaw or problem is not our responsibility; if we do not know what to look for we can not see it. Please examine the photos, as they are an important part of the description. Please feel free to contact me and Ill be happy to help. 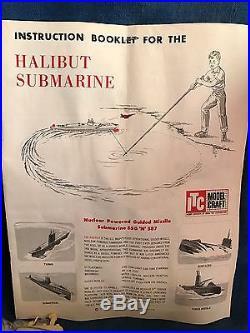 The item "Vintage 1960 ITC Model Craft Halibut Submarine Model Kit Ideal for Parts +" is in sale since Saturday, May 06, 2017. 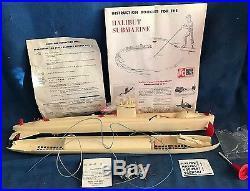 This item is in the category "Toys & Hobbies\Models & Kits\Boats, Ships\Plastic". 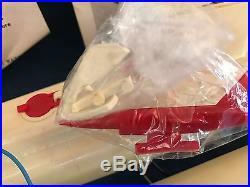 The seller is "crapapaloozaonline" and is located in Billings, Montana. 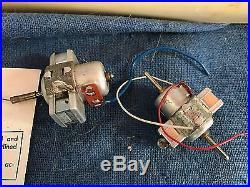 This item can be shipped to United States, Canada, United Kingdom, Denmark, Romania, Slovakia, Bulgaria, Czech republic, Finland, Hungary, Latvia, Lithuania, Malta, Estonia, Australia, Greece, Portugal, Cyprus, Slovenia, Japan, China, Sweden, South Korea, Indonesia, Taiwan, Thailand, Belgium, France, Hong Kong, Ireland, Netherlands, Poland, Spain, Italy, Germany, Austria, Russian federation, Israel, Mexico, New Zealand, Philippines, Singapore, Switzerland, Norway, Saudi arabia, Ukraine, United arab emirates, Qatar, Kuwait, Bahrain, Croatia, Malaysia, Chile, Colombia, Costa rica, Panama, Trinidad and tobago, Guatemala, Honduras, Jamaica, Antigua and barbuda, Aruba, Belize, Dominica, Grenada, Saint kitts and nevis, Saint lucia, Montserrat, Turks and caicos islands, Barbados, Bangladesh, Bermuda, Brunei darussalam, Bolivia, Ecuador, Egypt, French guiana, Guernsey, Gibraltar, Guadeloupe, Iceland, Jersey, Jordan, Cambodia, Cayman islands, Liechtenstein, Sri lanka, Luxembourg, Monaco, Macao, Martinique, Maldives, Nicaragua, Oman, Pakistan, Paraguay, Reunion.